The stock has remained a major underperformer in the last 1 year. A breakout was seen a few days back at 200 odd levels. The current consolidation in the range of 204-210 is almost finished and we could expect the stock to retrace to 61% of the downmove. Buying at 208-209 with a stoploss of 205 and a target price of 218/225 in 2-3 weeks is a nice low risk high return trade. 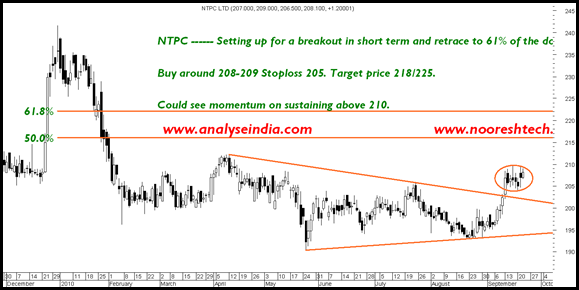 Buy Ntpc 210 ca@2.8 sl1.3 is good strategy. Kindly reply as soon as u can. why u asked to exit NTPC yesterday.. bought at 209..
What about yr target of JSW energy 155 is now going down ???? Stopped out on that trade. Sir SL in RCAP is on closing basis or Intraday Basis. Stoploss on closing basis. Seems might get stopped out. I have sent a mail to analyseindia@gmail.com for one week AnalyseIntra free trial , so that i can check and proceed with one month pack first and then move to Qtrly subscription. I have provided my mobile number there and really wanted to gauge the SMS speed, as i will be depending on it mostly. Also i have provided my yahoo chat id too. Apart from that i have requested something related to Bangalore seminar on TA. Can you please reply to my email when you find time without fail (or) if you want to discuss over the phone, then please let me know when i can reach you. Today I bought 5000 shares @Rs.38 of Nutek India by looking the chart as I think it has given the breakout. What do you suggest ? Can it go to Rs. 50 technically. Be disciplined when trading in futures. Take care of your leverage. We dont have a service specifically for Futures as we look for a good 5-15% short term trade so traders can also do it in normal equity position with the same stock. So you can join our QuickGains Premium which has short term trade. Now i am in good profits hope to get attached with you and earn something. Many thanks for free call of NTPC.